I originally conceived Can It Fit? 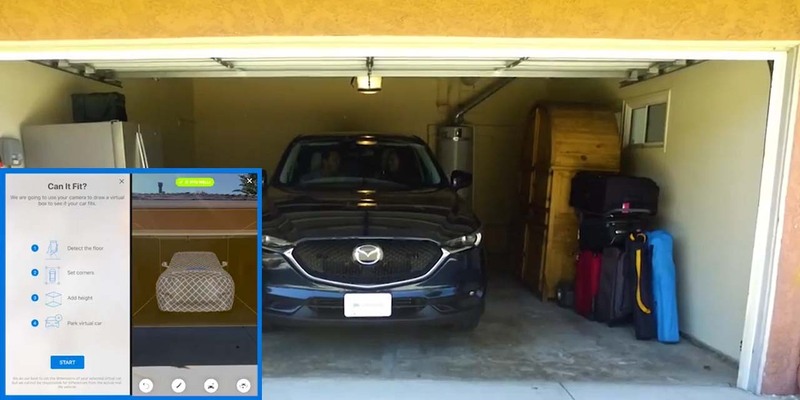 in mid-2016 to solve a problem that many automotive shoppers face - determining if the vehicle of their dreams can actually fit in their garage or parking spot. As the consumer version of the technology needed wasn’t available, the original prototypes were developed using Google Tango Development Kits and the Microsoft HoloLens. Utilizing the prototypes already created, in January 2017 I pitched Can It Fit? directly to Apple, Edmunds’ main mobile platform. Upon the WWDC announcement of ARKit with Apple iOS 11, Apple contacted us to bring “Can It Fit?” to life and to be featured by Apple at the new iOS release. Employing Edmunds’ in-house mobile team, Can It Fit? was built completely with Apple’s SceneKit and integrated into version 12 of the Edmunds mobile app. On release, Edmunds received high praise from many media outlets, including tech sites Gizmodo, Computerworld, CNET, BGR and Engadget. In addition, the Edmunds app with Can It Fit? was featured in many top lists of ARKit applications to use. In the first week of the new version’s release, the team tracked an increase of over 700% in new users accessing the Edmunds mobile app specifically to interact with the Can It Fit? feature. Additionally, we were able to develop a new B2B relationship with Google due to their interest in bringing Can It Fit? to Android.